SocEntLab East Africa was founded 21. March 2011 SocEntLab was started as Caxtus Social Enterprise, but changed its name after merging with a norwegian company. It is a social enterprise and thinkthank based in Nairobi, Kenya, started by Svein Mork Dahl and Lillian Wangondu spring of 2011. Our mission is to invest in change. 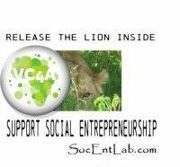 SocEntLab creates new solutions and invests in job creating and education in Kenya through own projects and direct investments and microloans in SE-companies or SE-projects.